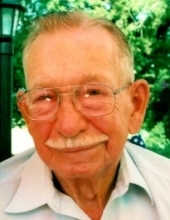 Melvin Edward Jonas, age 97 of rural Fox Lake, died early Tuesday morning, October 4, 2018 at his son’s home. A memorial service will be held at the Robert W. Ginther American Legion Post 521 in Fox Lake at 11:00 a.m. on Wednesday, Oct. 10, 2018 with Chaplain John Mund officiating. Inurnment will follow in Riverside Memorial Park. Relatives and friends may call on the family on Wednesday at the American Legion Post from 10 a.m. until the time of service. Melvin was born on August 29, 1921, one of ten children to William and Hulda (Klausch) Jonas. Melvin served his country in the U.S. Army during WWII. He entered the service in 1942 at Fort Sheridan, IL then Fort Bragg, NC for basic training, later at Camp Shelby, MS where he was an engineer. He served in 1106 Engineer Combat Group VII Corps. Melvin received Bronze Stars for participating in Battle of the Bulge in Normandy, France. Melvin worked for Speed Queen and retired in 1983 at the age of 62. Throughout most of his life he farmed and sold produce. He loved chickens and belonged to the Beaver Dam Bantam Club. He and Elizabeth would go to county fairs to see the animals and 4H kids that bought his chicks. Melvin enjoyed woodworking and made doll housed and a barn for his grandkids, along with many other wood projects for his family. Melvin was a member of Robert W. Ginther American Legion Post 521 in Fox Lake. Melvin will be sadly missed and mourned by his son, Gerald (Cheryl) Jonas of Fox Lake; hi two granddaughters, Kerry (Jason) Niemuth of Watertown and Kathleen (Matt) Kwakkel of Waupun; his great granddaughters, Liberti and Lydia Jonas; sister-in-law, Lorraine Jonas; brother-in-law and sister-in-law, Russell (Betty) Maurer; nieces, nephew, many other relatives and friends. Melvin was preceded in death by his parents, his wife Elizabeth on April 20, 2017, his grandson Jeffry on Jan 16, 2005, four sisters and five brothers. The Kratz-Smedema Funeral Home in Fox Lake is serving the Jonas family. For more information or online condolences, please visit www.kratzfh.com. To send flowers or a remembrance gift to the family of Melvin Edward Jonas, please visit our Tribute Store. "Email Address" would like to share the life celebration of Melvin Edward Jonas. Click on the "link" to go to share a favorite memory or leave a condolence message for the family.